Facts about Charolais Cattle, The Charolais Cattle is one of the oldest French cattle breeds. It was developed in Charolles district in France, and was among the first of Europeans breeds introduced in Australia. It has become so popular in Southern USA, increasingly replacing the Hereford breed. "Fear of cattle is Bovinophobia". "Scientific name for cattle Bovine". The Charolais Cattle can either be white or creamy-white in color, though recently others have started breeding black and red colored. Some have horns, but of late polled breed is the preferred option particularly for cattle intended for feedlots, where horns are deemed dangerous to people or other animals. Charolais Cattle have long coat that is slightly wavy during the winter period, and sheds in spring to have a short and smooth coat. 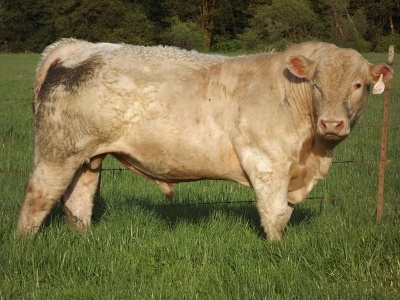 The Charolais Cattle chest is deep, the body is broad and has a strong well muscled hindquarters. The bulls can weigh up to a maximum of 2,500 to 2,000 pounds (1134 to 907 kg) for the cows. Just like the Hereford breed, Charolais Cattle are hardy cattle that are able to withstand the cold winters and the hot summers. Another of the Charolais Cattle breed advantage is that it grazes on pasture that many other cattle breeds can’t use efficiently to gain weight and muscles fast. The Charolais Cattle hooves are rugged making them able to walk on rough terrain easily. The cows calve so easily, one of its most priced traits. The calves are born with heavier weight compared to the other breeds. Though the Charolais Cattle have an aggressive appearance, they are simply docile and easy to rare. Primarily the Charolais Cattle are bred for meat production. They are among the top breeds related to the meat production rivaled only by the Angus breed. The Charolais Cattle breed’s bull can be crossed by Brahma, Hereford Angus cows which results in a hardy offspring with most of the best qualities of the Charolais Cattle breed retained. With Charolais Cattle, there are two particular types that highly discouraged. The type which the bull is tall, flat sided and has a slack back with poor hindquarter. It cannot compete in the current beef industry. The other type is also a bull; it is double-muscled and has a heavy shoulder. This particular type of the breed has associated calving and associated fertility issues. Beef is consumed through out the world. Beef is eaten as roasts, steaks, and hamburgers. The other way it is used is meat by-products, this includes brains, intestines, horns, hides, diaphragm, heart, hoofs, hair, lips, snout, ears, bones and tongue. These meat by-products are used in many products that include margarine, dog food, makeup, chewing gum, marshmallows, shampoo, ice cream, gelatin, cement, chalk, and tennis racquets, fertilizer, piano keys, glues, wallpaper and strings for musical instruments. There are three different phases the way Beef is raised, the calves are raised on farm land and out in the pasture, used as feeder cattle they feed in the pasture on grass and crop residue. Finally the beef goes to troughs of feed, where the beef is fattened to be slaughter. The slaughterhouse is where the beef gets cut up and divided into different cuts, the (meat packer). This is were it is packed and sent to meat distributors where it goes to butchers and super markets.